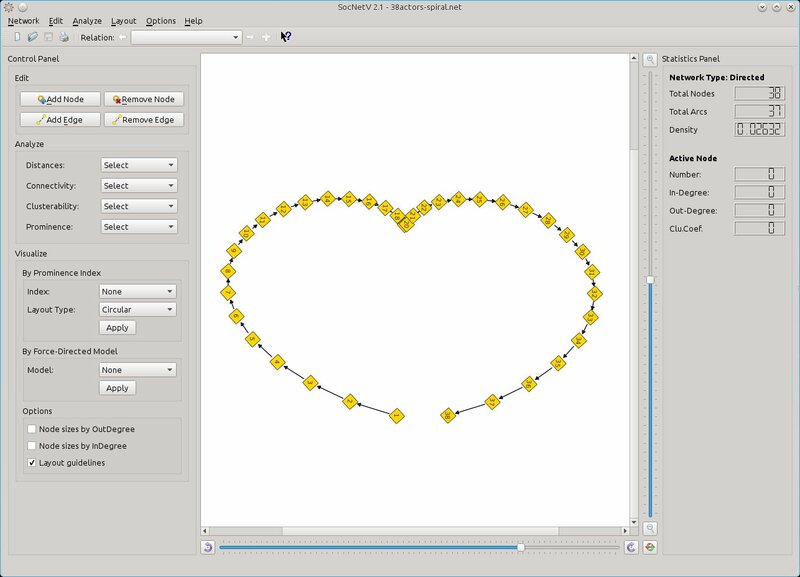 Draw social networks with a few clicks on a virtual canvas, load field data from a file in a supported format (GraphML, GraphViz, Adjacency, EdgeList, GML, Pajek, UCINET, etc) or crawl the internet to create a social network of connected webpages. 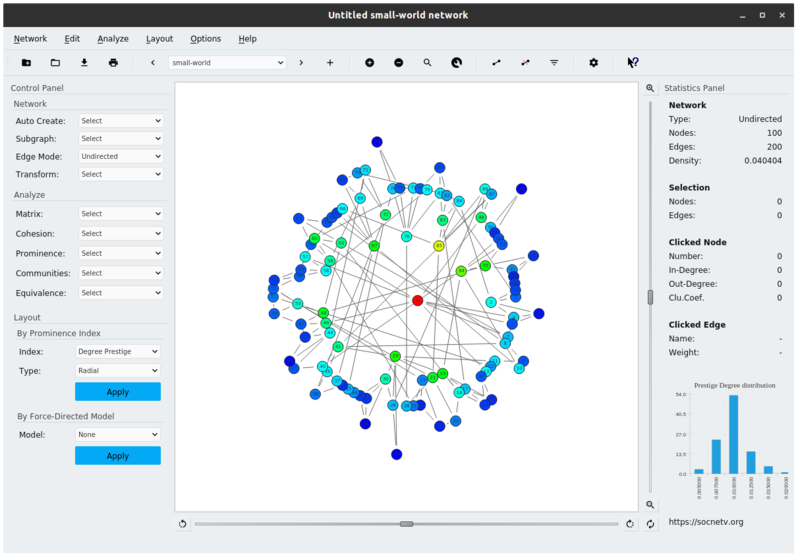 Edit actors and ties through point-and-click, analyse graph and social network properties, produce beautiful HTML reports and embed visualization layouts to the network. 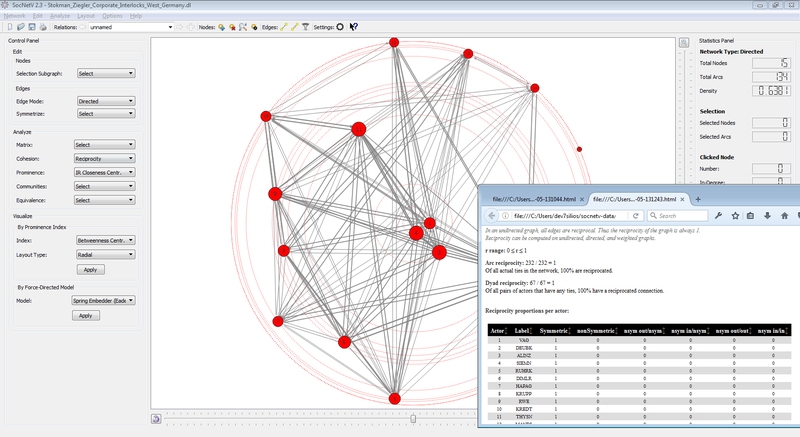 Standard graph and network cohesion metrics, such as density, diameter, geodesics and distances, connectedness, eccentricity, clustering coefficient, reciprocity, etc. Advanced measures for social network analysis such as centrality and prestige indices (i.e. eigenvector and closeness centrality, betweenness centrality, information centrality, power centrality, proximity and pagerank prestige). Fast algorithms for community detection, such as triad census, clique census,etc. Structural equivalence analysis, using hierarchical clustering, actor similarities and tie profile dissimilarities, Pearson coefficients. Layout models based either on prominence indices (i.e. circular, level and nodal sizes by centrality score) or on force-directed placement (i.e. 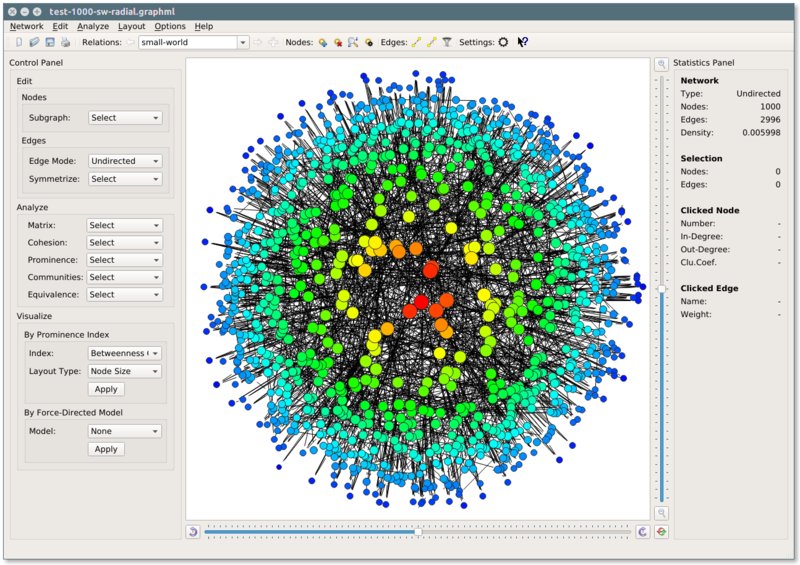 Kamada-Kawai, Fruchterman-Reingold, etc) for meaningful visualizations of the social networks. 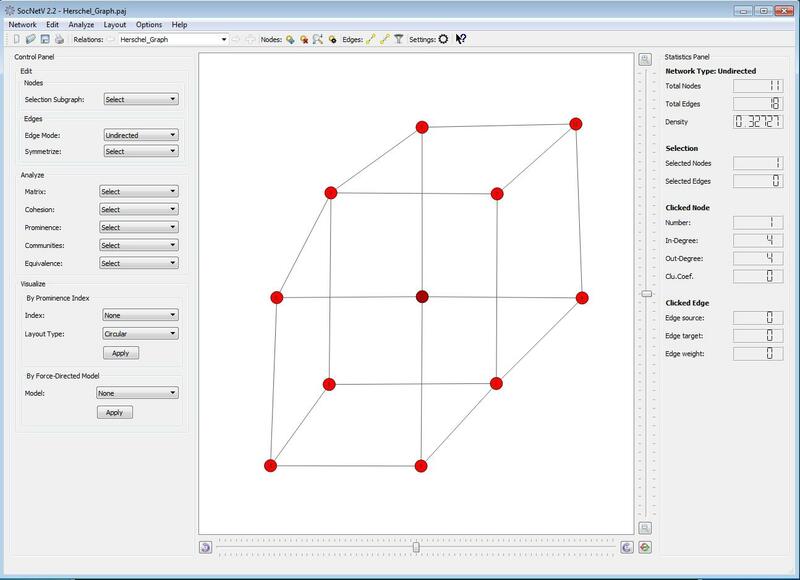 Multirelational network loading and editing. Load a social network consisting of multiple relations or create a social network on your own and add multiple relations to it. Famous social network analysis datasets, i.e. Padgett's Florentine families. Built-in web crawler to automatically create "social networks" from links found in a given initial URL. Comprehensive documentation, both online and inside the application, which explains each feature and algorithm of SocNetV in detail. Source code, packages and executables for Windows, Linux and Mac OS X are available in the "Downloads" page. You can copy it as many times as you wish, or modify it, provided you keep the same license. The documentation is also Free, licensed under the Free Documentation License (FDL). If you are a C++/Qt developer, you can help our project by commiting your patches (new features and bugfixes) to our source code development tree. If you are a proud SocNetV user (person or institution), you can help us by reporting bugs, proposing new features in our Issues or even donating whatever amount of money you like to the project. If you want to donate some money, click on the "Donate" button (in the page footer). You will be redirected to our Paypal donation account. In any case, thank you for using and contributing to SocNetV! Have fun with social network analysis. SocNetV v2.5 released with lots of new features and new looks! 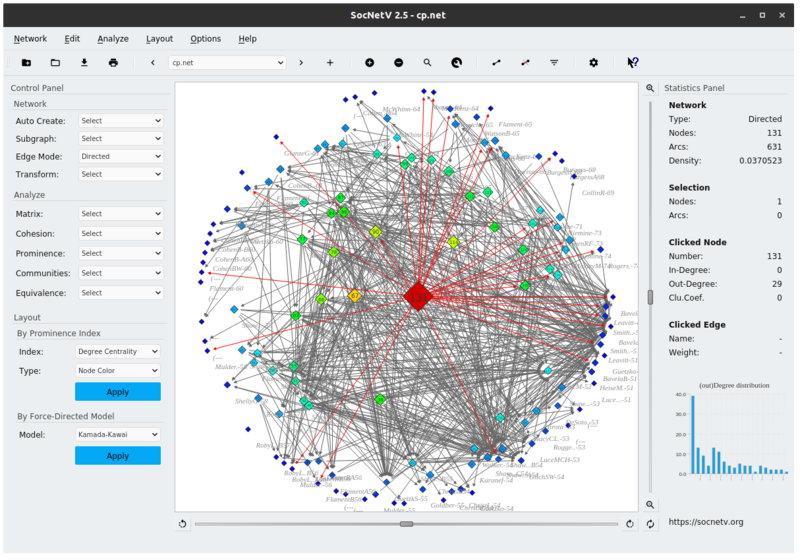 SocNetV v2.2 released with cluster analysis, eigenvector centrality and many more features!